Ruslan will wear anyone’s shoes. If they are left unattended he will put them on. Juliana has a habit of leaving shoes all over the house so he has the easiest access to those. He was very excited to try on these bright pink shoes this weekend (who can blame him, they are very fancy). My mom is often at the house waiting when I get home with the boys in the evening. 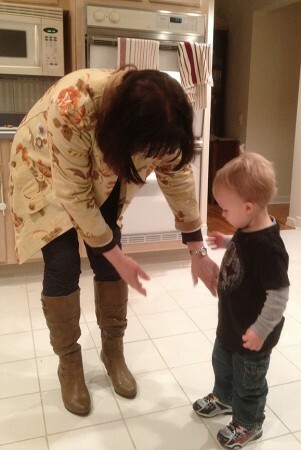 One evening last week, she opened the door and Ruslan immediately stopped, pointed at her and said “Nonni boots”. 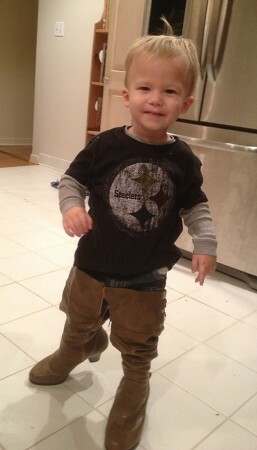 As soon as he was done eating dinner he demanded the boots, sat down on the floor and took his shoes off. He had a difficult time balancing but he giggled the entire time. For a boy who loves shoes so much, he is not a fan of socks. At night he removes his socks and also throws all of the blankets to the bottom of his bed. Each night before I go to sleep I cover him and put the socks back on if he is not wearing footie pjs. In the past month, Ruslan has come home from childcare with both shoes but only one sock not once, but twice. He takes his shoes and socks off and when they tell him to put them back on, sometimes he hides a sock and puts his shoe back on. They asked him where he was hiding the socks one day and he walked over to the toy purses, opened one and pulled out the socks. 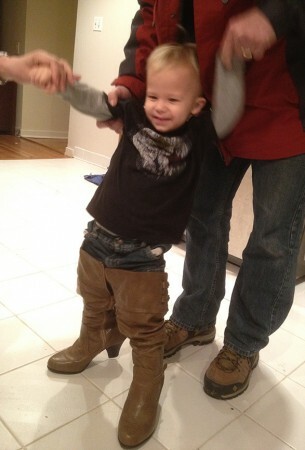 The pictures of Ru in your mom’s boots are priceless! He’s a cutie! 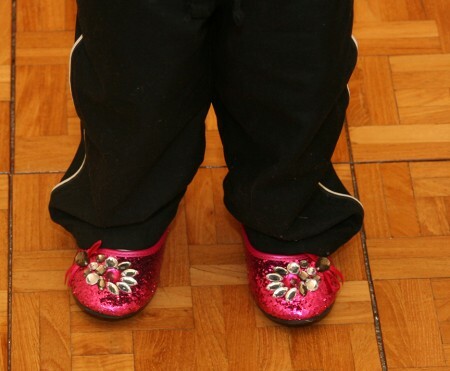 I love when my kids wear other people’s shoes around the house – such a fun past time. i remember wearing my mom’s black boots when I was a kid. It was so I could be a pirate. I had a roll of cardboard tubing to use as a sword. But the heels were too long. So I just looked like a toddler transvestite serial killer. No picture exist of this to my knowledge.